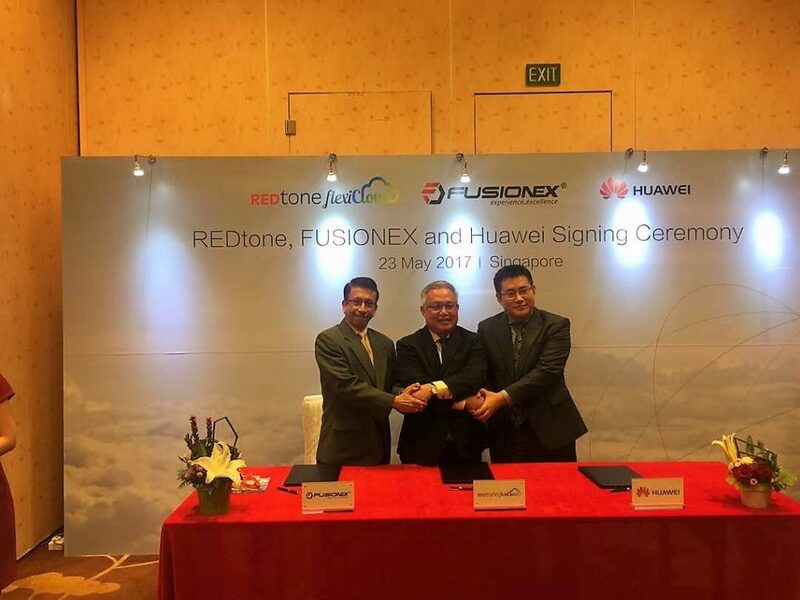 Huawei Malaysia and REDtone has jointly signed a cooperation agreement during the Huawei Cloud Summit 2016 in conjunction with Huawei Malaysia 15th anniversary. This agreement sees Huawei and REDtone joining effort in solution cooperation for the Business-to-Business (B2B) Cloud Service industry. The signing was attended by Andy Yau, Executive Officer, REDtone Data Centre and Jimmy Jin, Director of Data Center Dept, Huawei Malaysia. Witnessed by Lau Bik Soon, Group CEO REDtone International Bhd, Zhou Jianjun, Carrier Business President, Huawei Southern Pacific Region, Dato Wei Chuan Beng, Group Managing Director, REDtone International Bhd, Kevin Zhang, Corporate Marketing President, Huawei. REDtone has enhanced their cloud platform from basic virtual machine to high availability multi-site support. Together with REDtone’s Software-as-a-Service capability, the joint effort provides customers an end-to-end solution to their IT needs. This cloud platform is overall built on Huawei’s IT system including server, switch, storage, firewall and OpenStack cloud Operating System. To understand more about what exactly the REDtone/Huawei partnership is offering, DSA sat down in an exclusive interview with Khoo Boo Gee, Senior Solution Director, Southern Pacific Data Centre Marketing and Solution Sales Department; Lau Bik Soon, Group CEO, REDtone International; and Andy Yau, Chief Executive, REDtone Data Centre. Lau was very positive that the combination of expertise in local market knowledge, as well as Huawei’s technology they can make a difference in cloud adoption in Malaysia. Now, it’s not the first time we’ve heard about Telcos moving into the cloud sphere. And indeed, earlier in the interview, Lau was quick to emphasise that telco and IT industry is merging – more and more business requirement today has moved to the cloud. However, it does take a lot more as a telco to be playing in the big pond where big fishes like AWS and Azure swim in. Ok, on the surface that sounds brilliant. However, it is also curious from our perspective, to hear a CSP putting a lot of focus on their connectivity and infrastructure. “Cloud is beyond datacenter – it’s also about the connectivity.” Indeed, REDtone is a telco, and in their core, that will be their expertise and forte. But when you are trying to break in to the field of cloud, we think it’s about applications, performance and data management. With all of that said however, we have seen many big name telcos tried and failed in the cloud arena. While we don’t doubt both companies are excellent in their respective expertise, namely connectivity and infrastructure, we aren’t sure they have a full sussed out plan on how they should be approaching customers as a CSP; not to mention stacking against popular long term industry heavyweights in the CSP segment. So far, REDtone claims they have 2 architected sites of datacentre, but no clarification was made on the actual number of physical sites they do have. Failover capabilities are available per customer requests, and QoS policies are noted to be in place. It remains to be seen if they are able to be what iflix is to Netflix in Malaysia; we certainly would love a good local success story. At this moment in time, with what available details we have, from DSA perspective this telco/infrastructure partnership is about to go on a steep learning curve. They will need to adapt and learn quickly if they are able to vie on equal terms with the more application focused cloud providers who are leading the charge right now.